The "new" sign next to products at Whole Foods gets me every time. 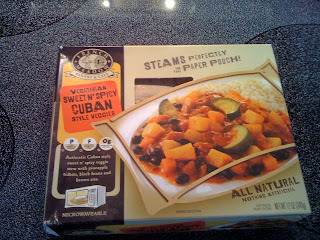 While wandering through the frozen food aisle on a recent trip, I noticed a new, seemingly interesting entree by French Meadow Bakery- Vegetarian Sweet 'N Spicy Cuban Style Veggies. What made this entree extra appealing to me (besides the fact that it's only 250 calories - amazing considering it comes with rice), is that it's not your traditional microwave meal. 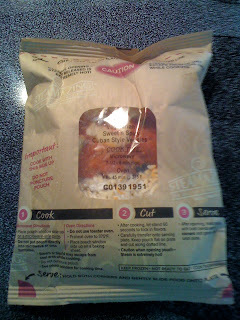 There's no plastic carton here - the food is cooked in a paper-ish bag. I'll admit, the paper "pouch" looked a little odd when I opened the box, but I still decided it was worth a try. I feel guilty eating so many entrees out of plastic containers, so I thought it was pretty innovative of French Meadow Bakery to try to use less wasteful packaging. After 8 minutes in the microwave and then 60 seconds of rest, I was able to messily (my fault, not the packaging) snip open the pouch and slide my food onto the plate. (the instructions actually tell you to try to slide the food onto the plate so it looks restaurant style) It was almost eerie how nicely it plated itself, right out of the bag. Looks are one thing, but how did it taste? Pretty fresh, I have to say. The veggies were fresh, the black beans weren't mushy, and the rice was perfectly cooked. 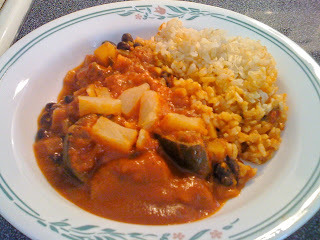 I'd compare this entree to the black bean mango frozen meal by Kashi that I'm a big fan of. This was the first time I'd ever had pineapple with veggies and I can honestly say I really liked it. Considering that this was a 250 calorie entree, it was really filling and the portion was large. I'd definitely recommend this dish for lunch or a light dinner. I hope to check out some of French Mewdow Bakery's baked goods. Their website shows all sorts of delicious looking breads and brownies, but they don't mention this entree. Hmmm. I hope you liked it! I thought it was pretty good and I really liked the innovative packaging.